At Studio City Dental Group, our orthodontist, Dr. Rosenberg, and his staff, strive to provide the best orthodontic experience possible for our patients. We focus on each patient's needs and care, while utilizing state-of-the-art technology. Through orthodontic care at our North Hollywood office, it is our goal to not only treat issues associated with misaligned teeth and jaws, but to educate our patients on preventing oral disease and decreasing tension and anxiety towards orthodontics. Traditional Metal Braces – When dental alignment issues are complicated, metal braces provide the most predictable and conservative way to achieve a healthier and more attractive smile. 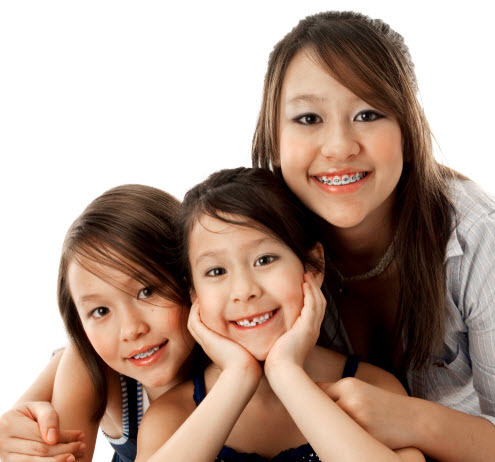 Metal braces are often recommended for children and teenage patients who need orthodontic adjustment so their smiles develop properly and are able to provide them with the straight teeth they want into adulthood. Clear Braces – For adult patients, or those with more moderate alignment issues, clear braces provide a nearly invisible treatment alternative to metal braces. Our North Hollywood orthodontist is a certified Invisalgn® specialist who can provide these clear braces to qualified patients. Invisalign® provides the comfort and convenience of removable aligner trays to ensure a positive treatment experience. Studio City Dental Group is fortunate to have multiple dental specialties in office. Our orthodontic team, other specialists, and general dentists, work hard to build a strong positive rapport with our patients. When needed, we can utilize a specialist the same time as your visit to provide valuable information about your treatment plant. Patients who need comprehensive care from multiple specialties in their orthodontic treatment are followed carefully to assure the best possible results. Orthodontic screenings for children are recommended by the age of seven. At seven, the teeth and jaws are sufficiently developed so that our pediatric dentist and orthodontist can see if any serious bite or growth problems are present or will be in the future. In providing orthodontics for young patients, our team communicates constantly with Dr. Gidan, our pediatric dentist, on every patient case. While treatment is often not needed at age seven, these early orthodontic screenings for children provide our orthodontist time to follow bone and teeth development and decide on the best mode of treatment. Recommended orthodontic care depends on the specific problem your child is facing. Many times, what appears to be a problem at one age, if treated early, may not be a problem at a later age. If your child has crowded teeth, or an apparent lack of space early on, managing these issues properly with early orthodontic intervention, may resolve the issue entirely as their smile develops. Our children’s orthodontic services can prevent permanent extractions and minimize the amount of care your child many need at a later age. Studio City Dental Group has the unique ability to treat a range of patients, especially those who require orthodontic care at a young age. Our practice philosophy is to provide exceptional care in an environment that helps to put our patients at-ease. Our team approach to orthodontics helps to educate and empower patients, so they can benefit from a positive attitude toward orthodontic treatment. We strive to make every visit a beneficial experience and to build self-confidence in our patients. For more information about braces, Invisalign®, or early orthodontic intervention for children, contact Studio City Dental Group today for your consultation.